NEW WESTMINSTER – TransLink and the HandyDART Riders’ Alliance today announced a joint settlement in a Human Rights Tribunal case regarding HandyDART services. 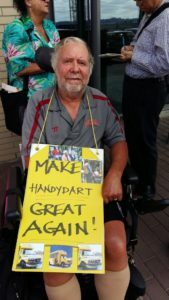 Seek Board approval to create a HandyDART Users Group. The Human Rights Tribunal case was originally filed in 2017 and was related to the provision of public transit to people with mental and physical disabilities. HandyDART provides an average of 5,000 rides per day. TransLink is committed to improving the customer experience for HandyDART users as we understand how critical these services are and we do our best every day working with our third-party provider, First Transit, to help our customers get to where they need to go safely and conveniently. 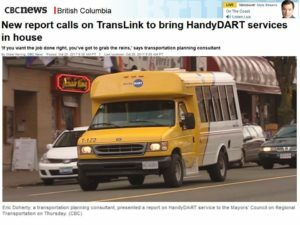 As a result of the Custom Transit Service Performance Review, TransLink has already taken steps to improve services for HandyDART users. TransLink is also in the midst of a 15 per cent increase in HandyDART service hours. 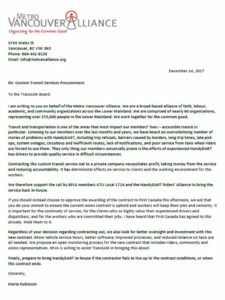 The HandyDART Riders’ Alliance applauds these initial steps in the Settlement Agreement, which work towards improving public transit for individuals with mental and physical disabilities, and looks forward to continued participation in creating a transit system that is accessible to everyone. The HandyDART Riders Alliance is a member of the Metro Vancouver Alliance (MVA), a great group of groups. Recently MVA Transit Team Co-chair wrote this great letter to the Vancouver Sun. Re: B.C. Budget 2019: Discounted transit fares, HandyDART funding absent, Feb. 20. In 2017, the B.C. Human Rights Tribunal agreed to hear a complaint alleging that the lack of HandyDART service in Metro Vancouver is a human-rights violation. That same year, John Horgan committed, if elected premier, to providing funding through a special grant to increase HandyDART service hours by 20 per cent over four years. More than 800 delegates from Metro Vancouver Alliance member organizations were there to hear Horgan’s words. Since then, the number of seniors and people with disabilities has continued to increase and the HandyDART crisis in Metro Vancouver drags on. There is still no line item for HandyDART in the provincial budget. Our 57 member organizations representing more than 700,000 people are still waiting for Horgan to follow through on his commitment. 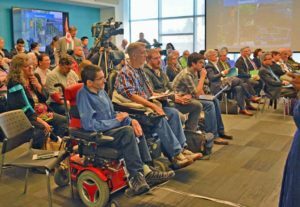 “Beth McKellar, co-chair of the HandyDART Riders Alliance called the lack of specific funding for HandyDART in Metro Vancouver “very, very disappointing” because the service is in demand. “There are people who want to sign up for HandyDART every day because they need it,” she said. It’s time to stop the poor service, says the HandyDART Riders’ Alliance. 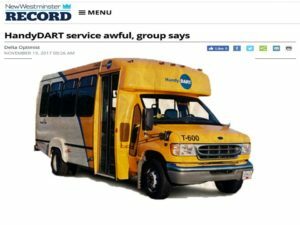 HandyDART Riders Speak Out! Join us Thurs November 16 at 9 am! The Mayors and the provincial government seem to need a reminder that this is a crucial time for HandyDART riders. Both the NDP government and the mayors have made some impressive promises about HandyDART and TransLink. But they need to hear you demand action! HRA News – Write or phone your mayor & MLA today! New HandyDART report! This is a crucial time for HandyDART, and we need your help today. Both the NDP government and the mayors have made some impressive promises about HandyDART and TransLink. But they need to hear you demand action! HRA News – Join us Thurs Sept 28 at 10 am! Time for HandyDART Riders to be seen again! It has been an eventful few months for HandyDART riders. 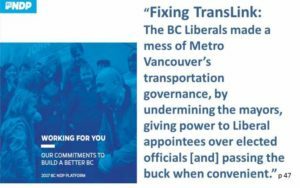 We now have a new government in Victoria that has made some impressive promises about HandyDART and TransLink. At the HandyDART Riders Alliance, we are hopeful but it looks like the new NDP government may need a reminder of the urgency of acting on these promises.